1. It declares the absolute leadership of the Party over the work of all zhengfa institutions, including courts and procuratorates. The assertiveness of this declaration indicates a complete and unambivalent severance from the judicial independence framework. 2. It officially brings back the concepts of two contradictions/conflicts: (external) contradiction/conflicts between the enemy and us (the people) and internal contradiction/conflicts among us (the people), as well as the concept of people’s democratic dictatorship as one of the guiding principles of political-legal work. (Article 6.6). We can expect to see two tracks of legal practices, one for external conflicts and one for internal conflicts, and both would be legal. 3. It introduces the concept of political security (appeared 9 times in the document) and commands that the party-groups of all legal institutions shall take the preservation of political security as a major task. 5. Party-groups of all zhengfa institutions answer to, first and foremost, the Party Centre (not the Central Political-Legal Committee). (Article 17) 6. 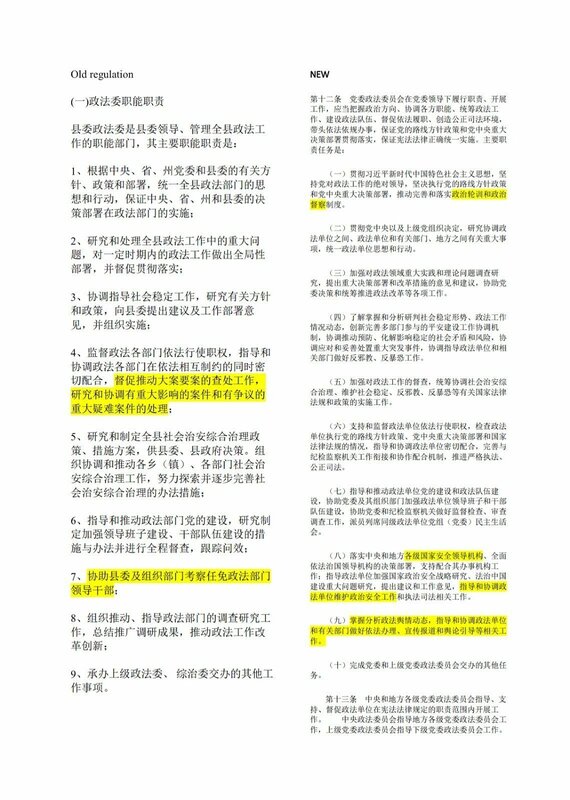 The National People’s Congress and the new National Supervision Commission are not subject to this directive. In this part, I would like to elaborate a bit further on what this Directive reveals about the change of power dynamics among top Party offices. In this aspect, what is most interesting about this Directive is Chapter 6 on the practice of seek-for-approval (qingshi) and report. Chapter 6 has demarcated, in the most concrete terms so far, the mandates of the Party Center and the Central Political-Legal Committee (CPLC) respectively in overseeing political-legal affairs and the activities of of zhengfa institutions (courts, procuratorates, police, national security ministry, ministry of justice). In particular, Article 17 requires the CPLC to report to not only the Party Center but also the General-Secretary (GS). It may look totally expected/predictable given the fact that Xi’s status as the core has been written into various Party policy documents. But in fact, it is very rare that the individual office of the GS or any other individual offices are mentioned or given a mandate in a party regulation that is publicly circulated and carries universal (cross-sector, region and rank) application power. 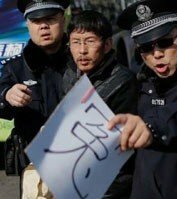 Instead, the GS, or any other members of the Politburo or Politburo Standing Committee (PSC) exercise their power behind the shield of “Party Center” most of time. After all, according to the communist doctrine, the Party is supposed to operate under the principle of the collective leadership and thereby the GS is given NO specific mandate in the Party Charter. At the same time, Article 17 also stated that all central zhengfa institutions (Supreme People’s Court, Supreme People’s Procuratorate, Ministry of Public Security, Ministry of National Security) all answer to and are required to report directly the the Party Center and the GS. It immediately reminds me of what happened in 1950 when Mao reproached Luo Ruiqing, then minister of public security, because the latter addressed a qingshi to the premier Zhou Enlai, who was Luo’s immediate supervisor, instead of Mao. Mao made it an issue and reportedly confronted Zhou Enlai on the phone in the presence of Luo. Since then, Luo submitted every single report directly to Mao. Two years later, such practice was extended to all functional departments under the state council (ministries, committees etc.) based on a resolution drafted by Zhou Enlai. But even in that resolution, it was the Party Center not Mao’s individual office that is stipulated as the recipient of all the qingshi and baogao from the ministers. Ministers were explicitly required to address their qingshi and baogao to Mao directly only when the issues were pre-earmarked by Mao. What were the practices regarding the communication and process of decision-making between Xi Jinping, Politburo, the CPLC and the SPC, SPP etc. since 2012 up till now is unclear since no such information has been made available in the public domain as far as I know. 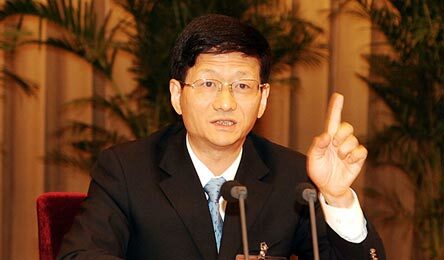 What seemed to have happened prior to Xi’s coming to power is that political-legal affairs for the most part were not in the purview of the GS but the head of the CPLC, Zhou Yongkang, who had a seat at the Politburo Standing Committee. As we know, after the 18th Party Congress, the CPLC was downgraded. Its head no longer has a seat at the PSC but only at the Politburo. That means someone at the PSC has to be assigned the supervisory responsibility/power regarding this policy field. I think we can reasonably presume that that responsibility has been assigned to or claimed by Xi himself since then. If that is the case, then the new directive has solidified such practices. 4. Why would the General-Secretary want to personally attend to and oversee legal affairs? The conclusion that I would draw from this development is that Xi and the Party has come to be very aware of the indispensability of the state legal system and the weight of legal institutions (in particular courts and procuratorates) in the party-state construct. Compared with two or three decades ago, courts are playing a much more important role in the administration of economic, social and political matters. So are procuratorates. And that is why Xi Jinping needs to get personally involved in the supervision of legal affairs. What we will witness in the foreseeable future is a continuing, or perhaps accelerated, process of an “organic” integration of the political and the legal systems that is designed to serve the political aims of the Party. It may create more problems than it solves but that seems the direction it is going. I am not aware of or have come across any written document that lays down specifically what kind of legal affairs that should be overseen by the Party Committee, prior to the Political-Legal Work Directive (the Directive) just issued now . So it is difficult to ascertain what has changed regarding the supervisory scope of the Party Committee in relation to the work of its Political-Legal Committee (PLC), i.e. what matters a PLC is required to seek for approval and/or report to a corresponding Party Committee. I have not come across any written document that specifies the mandates of the Central Party Political-Legal Committee in relation to courts, procuratorates and other political-legal institutions either. It is very likely that there was one but it was classified. HOWEVER, one can find a lot of local regulations which usually mirror the central regulation. So I pulled out a regulation of Fulu county in Yunan (no long available online) and juxtaposed it with Article 12 of the PLW Directive (see below). 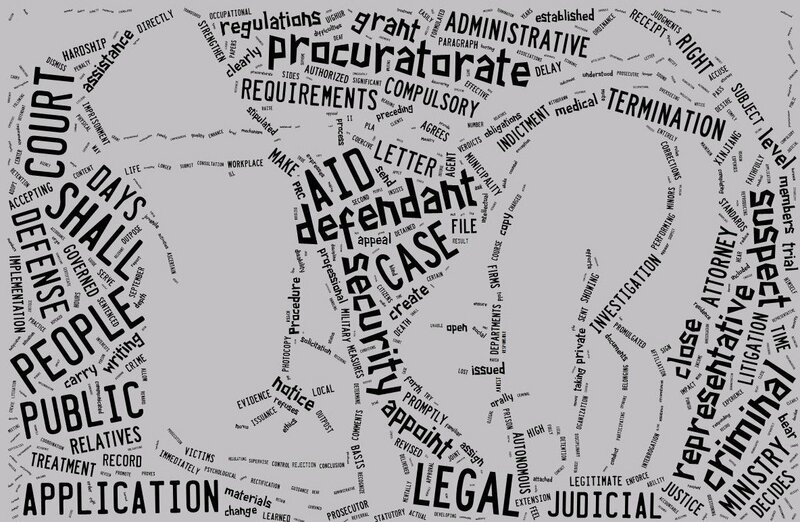 To oversee the handling of individual high-profile and high-stake cases. (depending on how you want to interpret the language of the new PLW direction, some of the provisions can be understood or would in fact be operationalized in the way that this practice will continue. But from the face of the Directive, the PLC shall no longer take on a hands-on approach to oversee the handling of individual cases. To assist the corresponding party committee and its personnel department to vet and appoint political-legal cadres. Again, depending on how you interpret Art. 12(6) of the new Directive, it can be understood that the PLC still holds some power/responsibility over political-legal personnel but from the face of the Directive, that power has been weakened. Party Central Political-Legal Committee weighs in on wrongful convictions Central Political-Legal Commission on Preventing Wrongful Criminal Cases SPC, SPP, MPS, and MoJ Regulation on Legal Aid Work in Criminal Cases Communist Court Quotes Bible? What judicial independence framework? The ethical is always more robust than the legal. Over time, it is the legal that should converge to the ethical, never the reverse. Laws come and go but ethics remain. Sextus Empiricus. 200 AD. The Party is constitutionally responsible for ethical leadership and it is simply reminding us of that fact. The estimated value for a full translation of this post is $448.20 USD at the below-market rate of $.06 per character, with 6,820 characters.